An update!!! 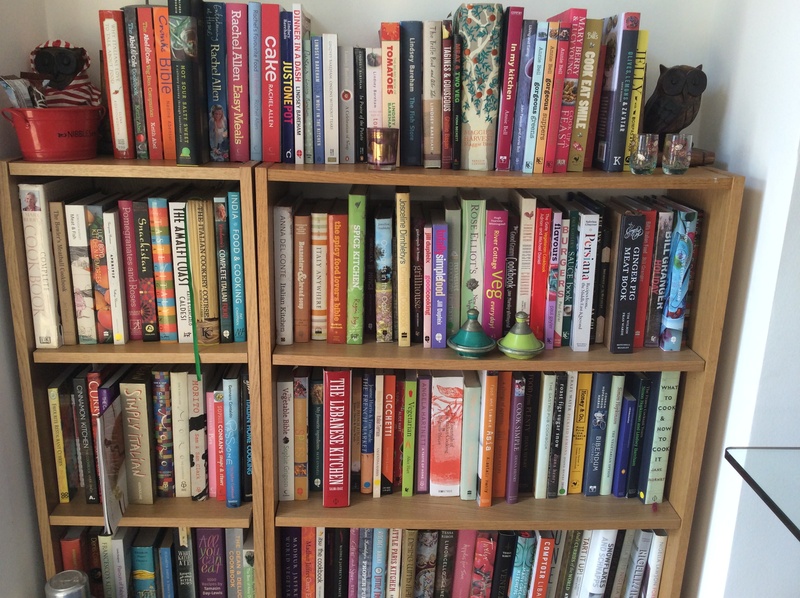 I am using ‘Eat Your Books’ to keep track of my books- click on the link at the right of the page to see whats currently on my shelves! I have many other books written about food, travel and restaurants, but I have not included them in this library- only ‘pure’ cookery books are here. Alastair Little’s Food of the Sun- one of the first cookery books I bought and it gives me so much inspiration I can not tell you. Just flicking through the pages gives me ideas and the energy to create something lovely. He has a little food shop near Notting Hill which is filled with really yummy delights. Lindsey Bareham’s Big Red Book of Tomatoes- I have 2 copies of this book! The first I’ve had for ages and is a little paperback. I love tomatoes and this is jam-packed with all kinds of different recipes, savoury and sweet, hot and cold, from all over the world. Colin managed to get hold of a bigger version, updated with more recipes, and I am holding onto both! Claudia Roden’s Arabesque- covering the foods of Morocco, Turkey and Lebanon this is typical mouth-watering Claudia Roden. She not only has recipes which work each time but brings them to life with the history and the culture of the food and the people. Some of my favourite recipes have been inspired by this book. Annie Bell’s Living and Eating- I have many of Annie Bell’s books but this is, in my opinion, the best. This is not just a cookbook as it covers kitchen design and equipment, and it does make you more than a little envious of Annie herself! There is a starter of baked goats cheese which is worth the book on its own. Nigel Slater’s Kitchen Diaries- Nigel Slater writes in a way that makes me starving! Never overly complicated his recipes are what you want to eat for your supper every night. There is a tomato curry which is so delicious, quick and easy that I would never tire of eating it. His follow-up is great too, but my memories of discovering the original will always make it special to me. David, Elizabeth- Is there a Nutmeg in the House? Parker, Paul- Lily Vanilli in a Zombie Ate My Cupcake!